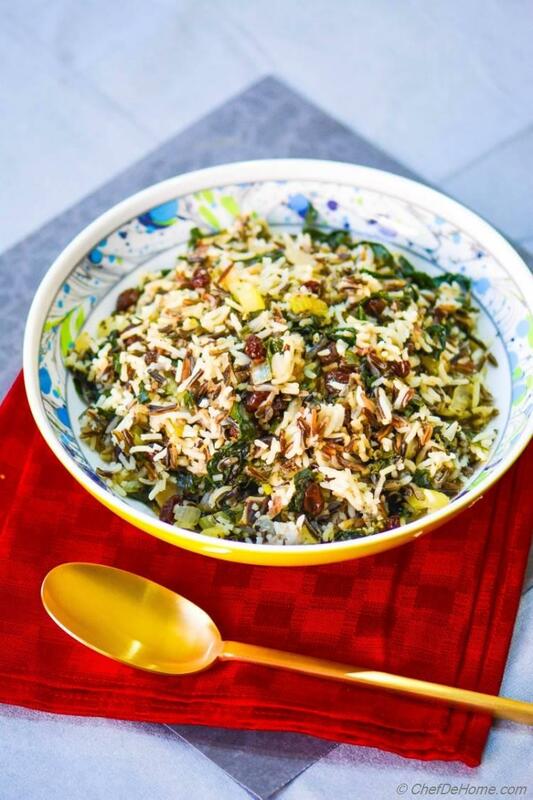 Day 5 of "15 days to Thanksgiving"
Hearty kale, meaty mushrooms, and delicious wild rice combine to make this vegan turkey dressing, gluten free yet packed with flavor of holiday favorite herbs, and sweet raisins. I am watching a trend, my post for the thanksgiving event, only ends up online late evening.... turns out running a thanksgiving holiday countdown is a huge commitment and I am working overnight here..... making recipes, clicking pictures, and sharing with you all everyday.... but I am not working alone now.... few of my foodie friends have also decided to participate and contribute some great thanksgiving recipes with you all. I will soon share their scrumptious thanksgiving cooking. 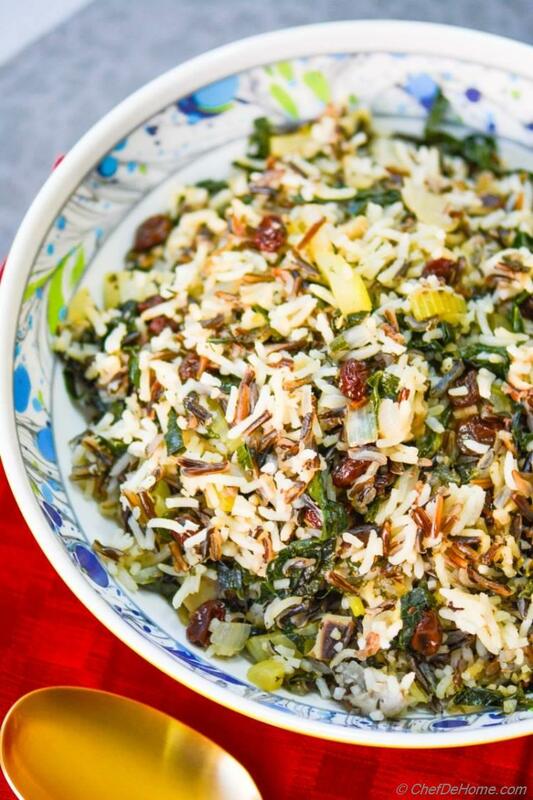 Today's recipe is most dear to my heart, not just because it is vegan and gluten free, but it has few of my favorite healthy yet substantial ingredients like kale, crimini mushrooms, raisins, and wild rice! 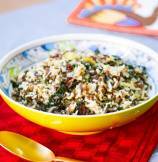 If you happen to visit Chef De Home regularly, you know my love for kale and mushrooms! Kale keeps going and coming back in my kitchen, all depends on when Vishal is done eating kale and can't have a spoon more.... me?? I can eat it in all meals, no problem.... So, after a short break, kale has recently re-entered my refrigerator and Vishal happily ate a side of Kale and Rice stuffing with roasted chicken over the weekend. 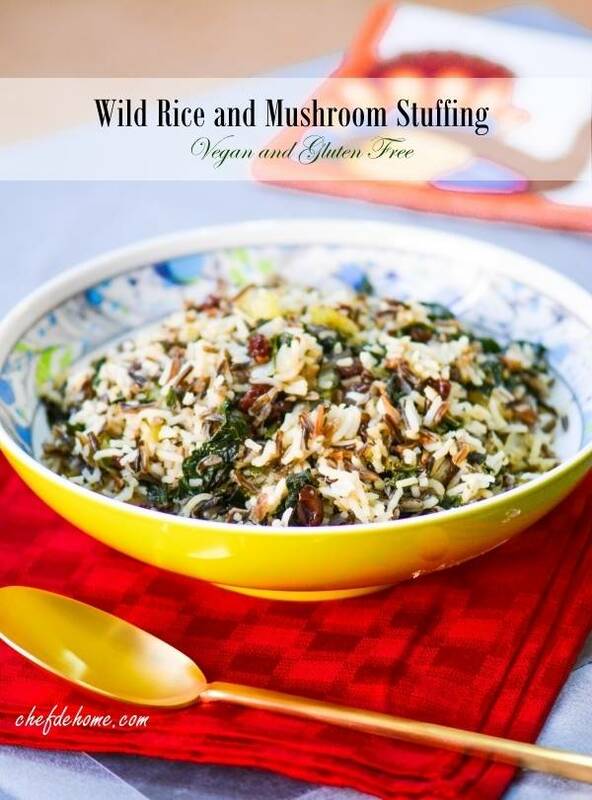 I had plans to make vegan and gluten free stuffing recipe since long... Hearty kale, meaty mushrooms, and delicious wild rice can make delicious and substantial turkey dressing, free of bread yet has great texture and very flavorful... If you are not looking for vegan stuffing, consider adding ground chicken or turkey sausage to this stuffing for an extra layer of flavor. 2. Substantial, hearty, and packed with herbs. 3. 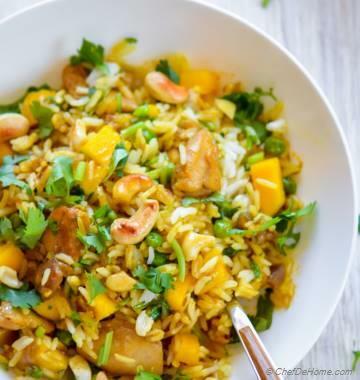 Has great texture with wild and long grain rice. 4. Savory with sweetness of raisins. 5. Rich in calcium, fiber, and anti-oxidants. 6. Stuffing will stay good in refrigerator for 4-5 days. You can also freeze it, just re-heat and enjoy thanksgiving food any day! You can also use chicken stock (not vegan) or just plain water if you don't have vegetable stock. Just remember to adjust salt and seasoning as per the taste. It is always best to season the rice water before cooking. 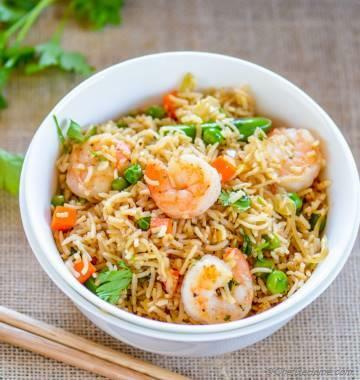 Just like pasta, well seasoned (not over seasoned) rice water can produce really flavorful batch of rice for any recipe. 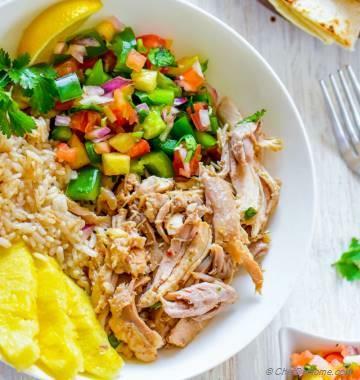 Enjoy holiday dinner with kick of health, low-calories yet scrumptious flavors, and don't forget to-check back tomorrow for yet another great thanksgiving dinner recipe. Total Time 1 hr 15 mins Prep Time 5 minutes Cook Time 1 hr 10 mins Difficulty Easy Yields 4 Servings Serves 8 Notes 4 substantial or 6 side servings. 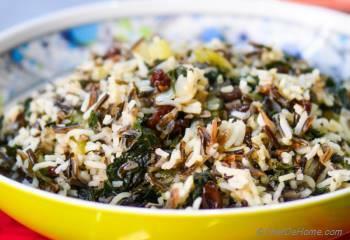 Smart Swap If time-pressed, replace wild-rice with quinoa, reduce cooking time to 1/3. 2. 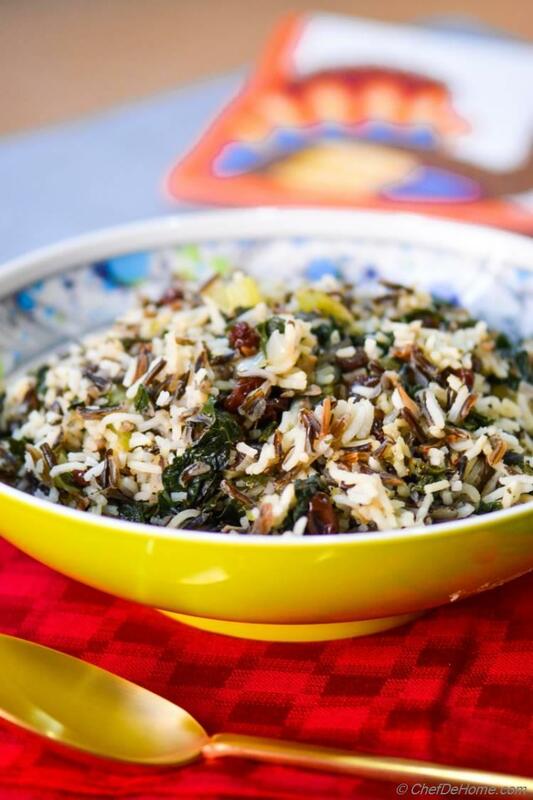 Cook Rice - In a large pot, bring wild rice and 2 cups of stock to rolling boil, then continue boiling for 45 minutes, or until rice are tender and split open. Season the stock with 1/4 tsp of salt (if using low-sodium stock). 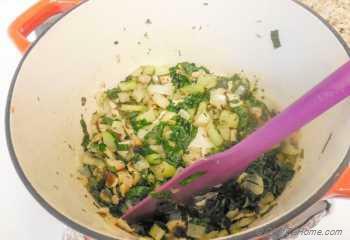 In last 10 minutes, at 35 minutes mark, add rinsed long grain rice to the pot with 1 cup more stock and continue cooking. 3. Cook Kale and Mushroom - Meanwhile, slice the mushrooms, celery, kale, and onion. Then, melt butter (or oil if using) in a (oven and heat proof ) casserole, add mushrooms, kale, onion, celery, sage, parsley, and thyme. Season with salt and pepper. cook for 2-3 minutes, or until kale has wilted. 4. 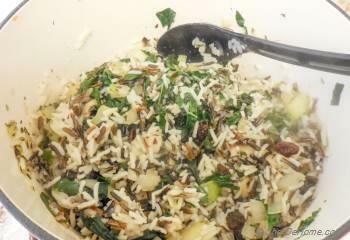 Assemble - Mix cooked rice with the kale-mushroom mix and raisins. 5. Bake - Cover and bake for 15 minutes, then uncover and bake for additional 10 minutes, or until dressing has little crusty top. Serve hot stuffing immediately or bring to room temperature and then refrigerate for up-to 5 days. Recipe doubles easily, simply adjust the herbs as per taste and make this stuffing for a bigger family gathering. This is NOT vegan if you use butter in the recipe. Hi Tanya, I agree. And it does not use butter. Butter was incorrectly picked in the ingredient list. It should say "Cocoa Butter". You can also use Olive Oil. Thanks for pointing out. Yumm! I am trying this soon!